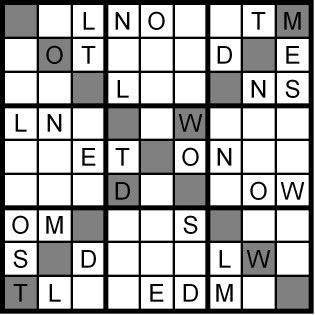 Today’s 9x9 Diagonal Word Sudoku puzzle is based on the word MELTDOWNS. 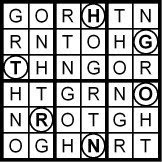 Yesterday’s Classic Word Sudoku puzzle was based on the word COURTESAN. 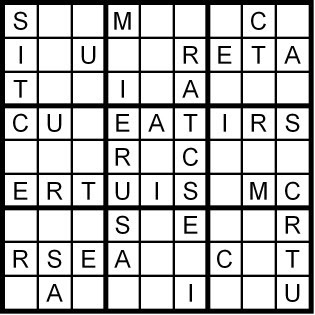 Today’s 9x9 Classic Word Sudoku puzzle is based on the word COURTESAN. 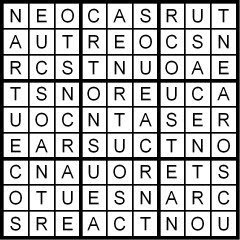 Yesterday’s Classic Word Sudoku puzzle was based on the word NARCOTISM. 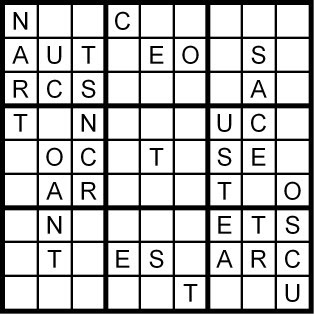 Today’s 9x9 Classic Word Sudoku puzzle is based on the word NARCOTISM. 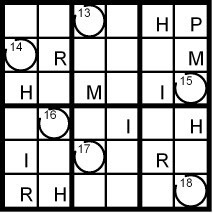 Yesterday’s Hidden Word Sudoku puzzle was based on the letters in the anagram GOD IN RUSH. 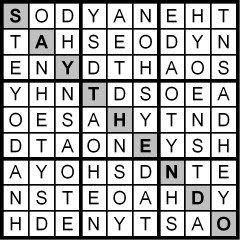 Today’s 9x9 Hidden Word Sudoku puzzle is based on the letters in the anagram GOD IN RUSH. 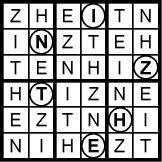 Yesterday’s Classic Word Sudoku puzzle was based on the word CHAGRINED. 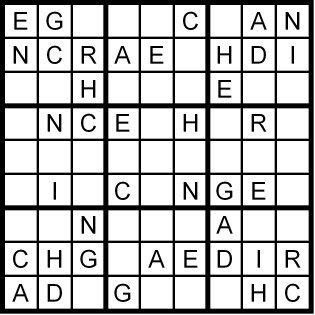 Today’s 9x9 Classic Word Sudoku puzzle is based on the word CHAGRINED. 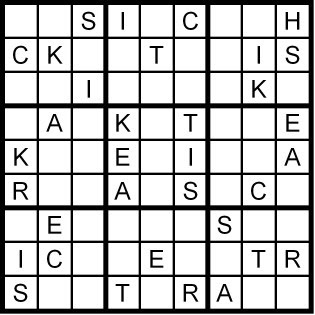 Yesterday’s Classic Word Sudoku puzzle was based on the word HEARTSICK. 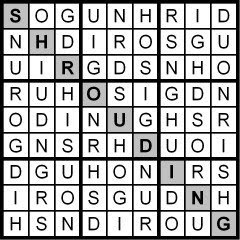 Today’s 9x9 Classic Word Sudoku puzzle is based on the word HEARTSICK. 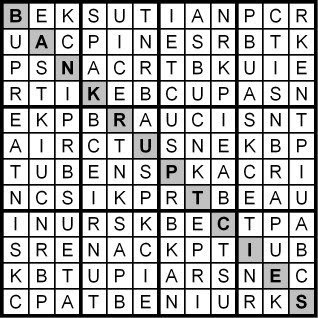 Yesterday’s Sunday Challenge Hidden Word Sudoku puzzle was based on the letters in the anagram BE STRUCK: PAIN. 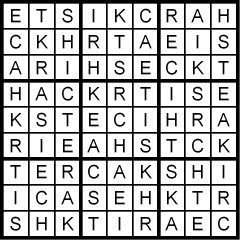 Today’s 12x12 Hidden Word Sudoku puzzle is based on the letters in the anagram BE STRUCK: PAIN. 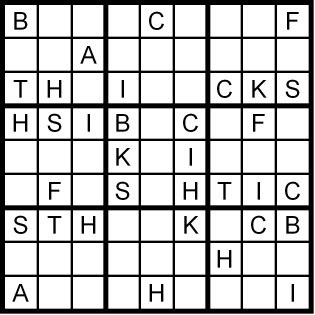 Yesterday’s Classic Word Sudoku puzzle was based on the word BACKSHIFT. 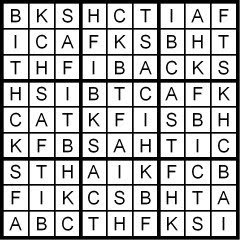 Today’s 9x9 Classic Word Sudoku puzzle is based on the word BACKSHIFT. 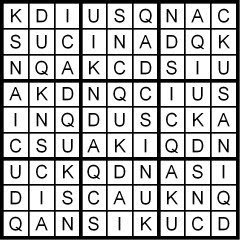 Yesterday’s Classic Word Sudoku puzzle was based on the word QUICKSAND. 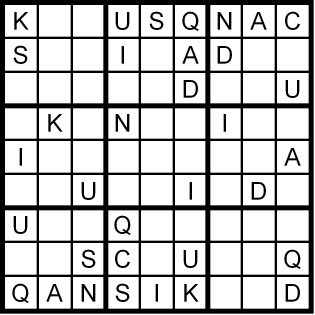 Today’s 9x9 Classic Word Sudoku puzzle is based on the word QUICKSAND. 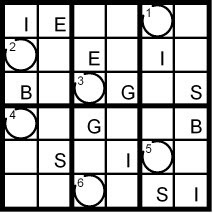 Yesterday’s Classic Word Sudoku puzzle was based on the word CAUTERISM. 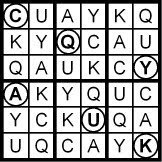 Today’s 9x9 Classic Word Sudoku puzzle is based on the word CAUTERISM. 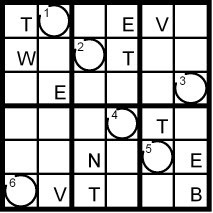 Yesterday’s Hidden Word Sudoku puzzle was a summary of the advice Richard Edelman, one of the world’s leading PR practitioners, had in summarizing the 10th “Trust Barometer” global opinion leaders study just released by the PR agency he leads. 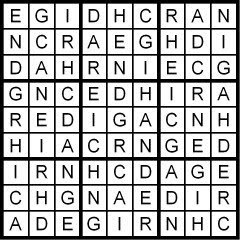 Please visit www.edelman.com for more on the study. 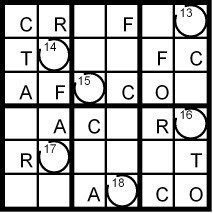 A new puzzle in just a little bit. One of the world’s leading practitioners in the field of public relations, Richard Edelman, came to my hometown of Portland, OR yesterday to present the latest findings of the 10th “Trust Barometer” global opinion leaders study. Mr. Edelman is the President and CEO of Edelman, known as the world’s leading independent public relations firm. The bottom line: Public trust in corporations, the media and all levels of government is at a 10-year low—even lower than after the Enron debacle. 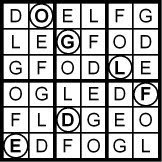 The public no longer looks to business to lead the way in solving the many issues facing us today. 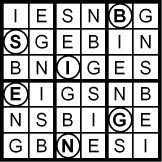 The survey found that the public believes government has the primary responsibility for solving these issues. Mr. Edelman said that business must join in partnerships with government and non-governmental organizations to play a role. 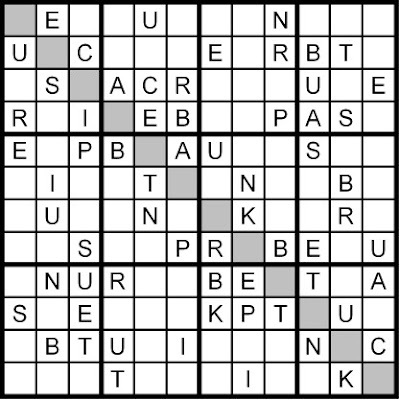 Mr. Edelman made the business case that trust affects—even helps define—the bottom line; then he exhorted business to simply be transparently honest in its actions, and to remember that the audiences business is attempting to attract, serve and keep are no longer limited to customers and stockholders. We also must take into account ‘stakeholders.’ Concerned citizens. Watching. And talking to their neighbors. Ignore them to your detriment! His talk and the Q&A lasted more than an hour, with many charts and graphs, so summarizing it all into one phrase is hardly fair, certainly not reasonable, and obviously glib. With those caveats, I present you the “5-second soundbite” of advice Mr. Edelman shared with the packed audience of Portland business, non-profit and government leaders. 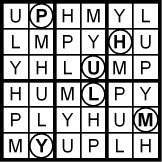 And since this a puzzle blog, I present you his advice in just nine letters—as a Hidden Word Sudoku puzzle. Solution first thing in the morning. 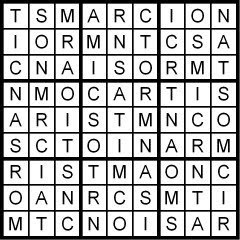 For more information on Edelman’s 10th “Trust Barometer” global opinion leaders study, please visit http://www.edelman.com/. 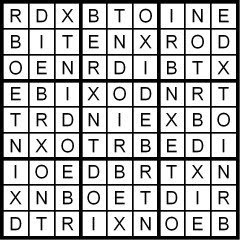 Yesterday’s Classic Word Sudoku puzzle was based on the words TINDER BOX. 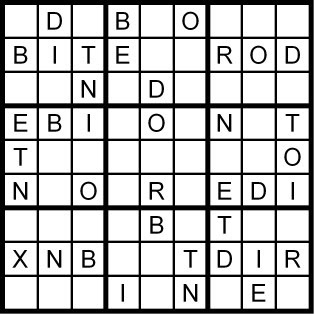 Today’s 9x9 Classic Word Sudoku puzzle is based on the words TINDER BOX. 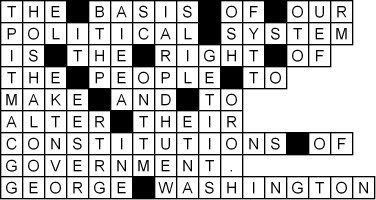 Yesterday’s Qudoku puzzle set used three Word Sudoku puzzles to feed letters into a quote from George Washington. 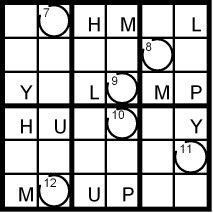 A new Word Sudoku puzzle coming your way in a few hours. Today is neither Abe Lincoln’s birthday nor George Washington’s birthday. Instead, it’s a bit of a compromise: It’s the day the U.S celebrates both famous men’s days, the third Monday in February, known as President’s Day. On the 12th, Lincoln’s birthday, I gave you a puzzle quote from Lincoln; so today, I present you a Qudoku puzzle set spelling out a quote from Washington. 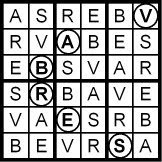 The quote uses 21 distinct letters of the alphabet. 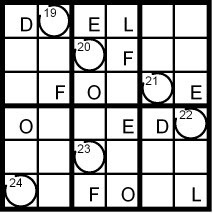 I give you three for free: d, k and v. And then I give you three 6x6 Word Sudoku puzzles using the other 18 letters, so once you solve the Word Sudoku puzzles you can feed the circled letters into the quote grid to spell out Washington’s quote. 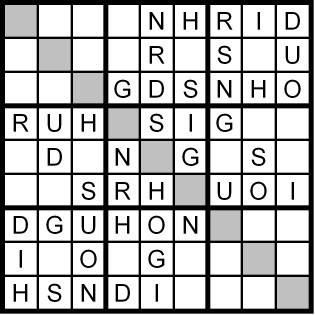 Yesterday’s Sunday Challenge Hidden Word Sudoku puzzle was based on the letters in the anagram DRUM BY TINGLE. 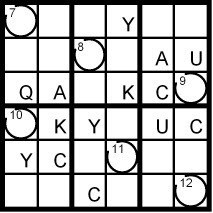 Today’s 12x12 Hidden Word Sudoku puzzle is based on the letters in the anagram DRUM BY TINGLE. This state entered the union on February 14, 1859, the 33rd state. 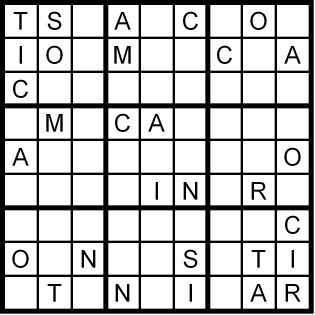 This state entered the union on February 14, 1912, the 48th state. 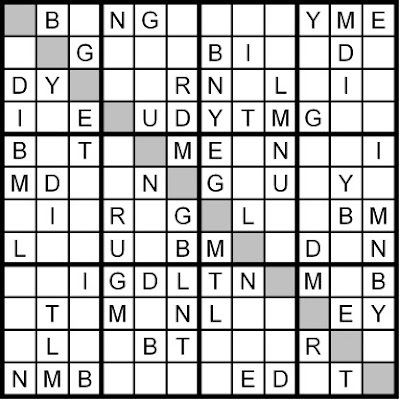 Yesterday’s intertwined Qudoku puzzle sets used four Word Sudoku puzzles to feed letters into three worthy quotes on love, in honor of Valentine’s Day . 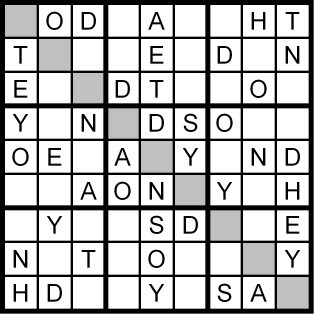 A 12x12 Hidden Word Sudoku puzzle I call the Sunday Challenge coming your way in a few hours. 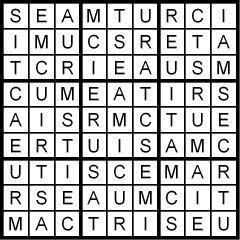 There doesn’t appear to be one and only one person called St. Valentine. And the one man who this day might be in honor of, died on this date. Not an auspicious occasion for love, if you ask me. So how did this day come to celebrate relationships, etc.? 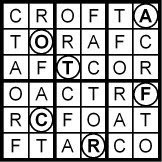 Best guess of the scholars I consulted: an attempt by the early Church to re-direct a ‘pagan’ holiday. 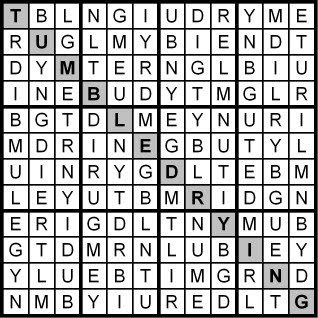 If that’s so, it worked pretty well…Hershey’s, anyone? 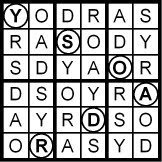 In honor of this lovely day to celebrate your relationships and indulge your passion for sweets, I offer you three quotes, each fed by the same four Word Sudoku puzzles—an entertaining intertwining if I ever created one!